2016 is our 50th anniversary year and we’ll be celebrating all year long in different ways! For this month, we’re asking our donors to dig out your first (or favorite!) CBB shirt and wear it when you donate! We’ll be taking photos of you in your throwback t-shirts and posting them to social media and the website. 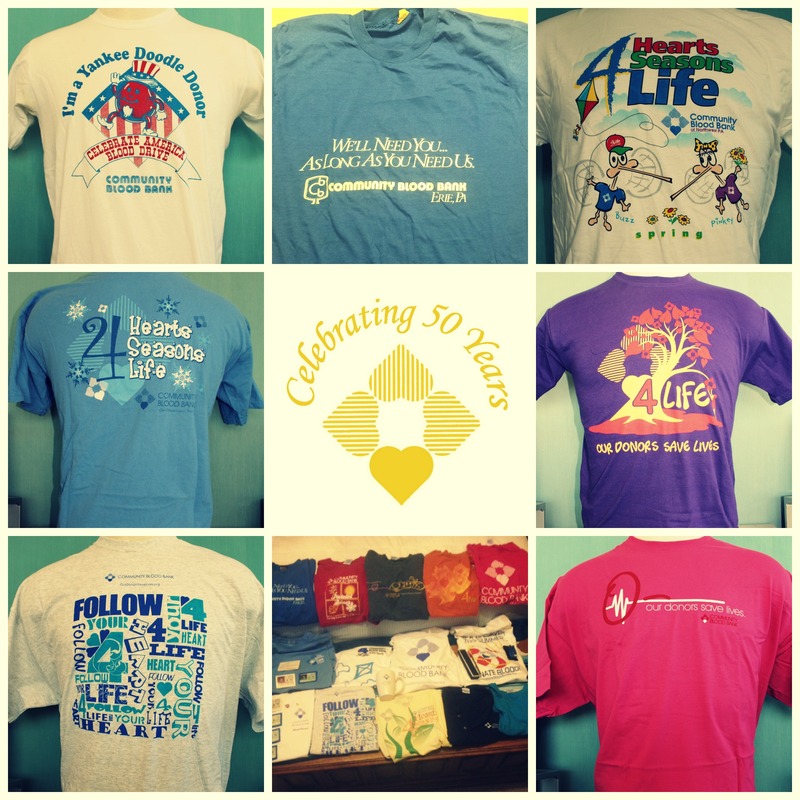 We can’t we to see your shirts and hear your memories! Walk for the Community Blood Bank! There are many different ways that you can participate this year! You can join the CBB team as a walker and help fundraise, you can make your own team and fundraise or join an existing team and fundraise that way! Not able to walk? Don’t worry! You can help support CBB’s fundraising efforts by just donating! 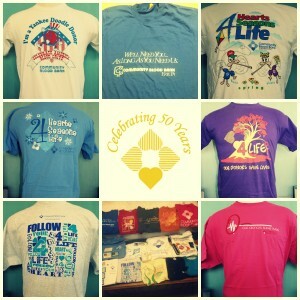 Donations can be made directly to CBB, to a specific walker, or to a specific team. All proceeds will benefit the Community Blood Bank’s campaign to acquire a second bloodmobile to better serve our donors. If you’ve visited our website or if you follow us on social media you’ve seen us talking about the importance of opting in to receive text messages from CBB. These messages aren’t just about promotions, they’re about helping patients when time is precious. A few weeks ago, a partner hospital was in need of a specific blood type to help an infant in the NICU. Our telerecruiters had called donors with this blood type on Friday but no one was able to commit to coming in. By Monday, we weren’t sure if anyone would be able to donate. Thanks to our donors who had opted in to receive text messages, our recruitment department was able to text 12 O- CMV- donors (the type needed) to ask for three of them to come to our Erie Donor Center that day. Because the message reached these donors immediately and they were able to take action, we were able to collect the three donations needed for the premature infant within hours. If you still haven’t opted in to receive text messages, please text the word BLOOD to 444999. Our ability to reach you quickly could make a world of difference for a donor in need. According to MobileSquared, over 90% of text messages are read in three minutes, compared with just 22% of e-mails in that same time frame. Donating blood is a special thing … only 5% of the eligible population does it! So we wanted to celebrate your donation milestones and give you a way to show off your achievements. Starting this year using your current number of donations, the Community Blood Bank will recognize your next milestone with a Milestone Window Cling. Donations are recognized in increments of 10 up to 100, then in increments of 50 from 150-450 donations. Clings can go on car windows, or any place you want to show off your commitment to saving lives and encourage others to donate blood, too! Please note that we are continuing our long tradition of celebrating your gallon achievements at our annual Donor Dinner. The cling program is an additional celebration of your dedication! Not sure how close you are to your next milestone? Log in to your donor portal through fourhearts.org and find out. Thank you to our GR8 GIVERS group from this month: Saint Jude Knights of Columbus! As a reminder, GR8 GIVERS takes place year round, and groups can consist of family, friends, co-workers, neighbors, classmates or members of your church. Once your group of 8 (although more are always welcome!) have signed in and donated during your selected week, you’ll automatically be entered into a drawing for a $100 gift card for breakfast or lunch for your group! Already have your group selected? Simply contact Deanna Renaud, Recruitment Manager for Community Blood Bank, at drenaud@fourhearts.org OR at (814) 456-4206 to reserve your week! Congratulations to Robert Evertsen, who won the $100 gift card in December! One winner is selected at random from the point store drawing each month, you can enter as many times as you’d like each month OR you can redeem your points for something tangible like a coffee mug, t-shirt, or gift card. Your points are yours to use as you’d like, happy shopping!